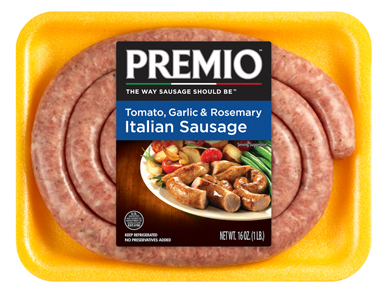 Premio Tomato, Garlic & Rosemary Italian Sausage has flavors that will bring any meal to the next level. A tasty addition to a breakfast casserole, lunchtime soup or pasta dinner, this sausage pairs perfectly with just about anything you have in your fridge. Order some today. Ingredients: Pork, Less than 2% of the following: Water, Salt, Brown Sugar, Potassium Chloride, Natural Flavors, Spices (including rosemary, basil, black pepper & fennel), Garlic Powder, Dehydrated Onion, Dehydrated Tomato, Tomato Powder, Dehydrated Parsley, Extractives of Paprika. Stuffed in Sheep Casings. Add tomatoes, garlic and rosemary to Premio sausage and you’ve got our famous Premio Fresh Tomato, Garlic and Rosemary sausage. This appetizing and flavorsome sausage is guaranteed to leave your taste buds happy and jolly. We make our Italian sausage for different tastes and different moods. We know there are a lot of great ways to enjoy sausage and you don’t necessarily want to have it the same way every time. This Italian sausage with garlic, rosemary and tomatoes really gives you a distinct Italian flavor that you can enjoy any time you’re in the mood for sausage or when you’re looking for a twist on your typical Premio sausage favorite. For a wholesome meal that will kick-start your day, try a Bourbon Street Breakfast Bake, which, with its abundance of flavors packed into every bite, is sure to get you ready for your day. Is that as delicious as it sounds? Find out for yourself! Here’s the recipe. You’ll need a pound of Premio Tomato, Garlic and Rosemary Sausage, thawed and removed from casings. Then you’ll need half a cup of chopped red onions, half a cup of shredded parmesan-Romano cheese, a quarter-cup of chopped green bell peppers, a third-cup of thinly sliced green onions, a third-cup of dry white wine (you can substitute chicken broth), eight cups one-inch cubed day-old bread, two and a half cups of milk, a quarter-cup melted unsalted butter, a half-pound of grated pepper jack cheese, a half-pound of shredded Monterey Jack cheese, eight large eggs, fork-beaten, three-quarters of a cup of sour cream, three-quarters of a teaspoon of salt and freshly ground black pepper and cayenne pepper to taste. Preheat your oven to 325 degrees Fahrenheit. Then sauté your Italian sausage with rosemary, tomatoes and garlic for about five minutes, to a golden brown. Throw in the onions and peppers and stir for about three minutes. Put in your wine/broth and stir over high heat for about a minute. Then, remove the mixture from heat and set it aside. Take your bread and mix it with milk and cream in a large mixing bowl and let sit for five minutes. Now pour your melted butter into a 9” x 13” baking pan, coating the bottom and sides evenly. Put any extra butter into the bread mix. Now mix the Italian sausage with tomatoes, garlic and rosemary mixture in with the bread mixture and throw in the eggs, Monterey Jack and pepper jack cheeses, salt and pepper. Fold it all together, cover it with foil and bake for an hour. Then remove the foil, bake for 15 more minutes, take it out of the oven and turn up the heat to 375. Spread the sour cream and grated Parmesan-Romano over the top, bake uncovered for 15 more minutes and you’re done! You’ve now got a delicious Italian sausage with garlic, tomato and rosemary bake the whole family will love! Let us know how yours comes out! Premio Tomato, Garlic and Rosemary Italian sausage is a great choice for any meal. Have the Breakfast Bake, have a sausage and peppers sandwich for lunch, or add an extra punch to your dinner and combine Premio Tomato, Garlic and Rosemary sausages with Penne and Spicy Vodka Tomato Cream Sauce for a positively scrumptious pasta recipe. Use our store locator to find where our tomato, garlic and rosemary sausage is sold near you!